AVS endorses and sponsors many topical conferences each year. These conferences with a specialized focus are held worldwide. Members are encouraged to organize a topical conference in their area of expertise. 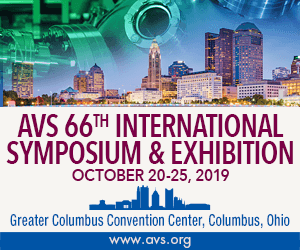 The AVS International Symposium and Exhibition addresses cutting edge issues associated with materials, processing and interfaces in both the research and manufacturing communities. The weeklong Symposium fosters a multidisciplinary environment that cuts across traditional boundaries between disciplines, featuring papers from AVS Technical Division, Groups, Focus Topics on emerging technologies and more.